When I go to the Ivey Awards this fall, I'm going to recognize many more theater companies and productions than I usually do. In the last year I've attended many shows by theater companies that I was previously unfamiliar with, and last night I crossed another one off the list: Pillsbury House Theatre (thanks to the Guthrie Studio Theater for bringing many of them into a space I'm familiar and comfortable with). How can I describe In the Red and Brown Water? Fortunately there was a post-show discussion that helped me understand it a little better. On the surface the story's pretty simple. A young woman loses her mother and her dream of becoming a track star, and wanders through her life looking for something to cling to. The staging is very simple too; there's nothing on stage but a dozen lawn chairs on an upward sloping reddish brown floor. But the themes are more complex; it feels like a piece I need to see a few times to fully comprehend. 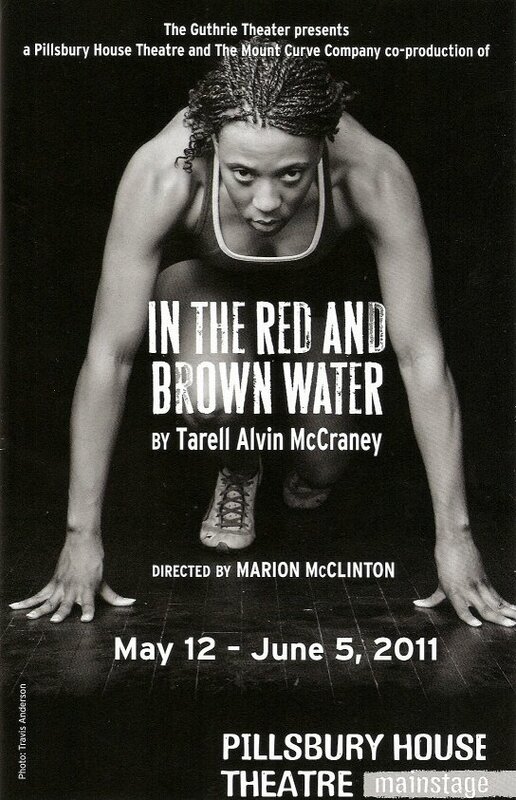 Lucky for me, Pillsbury House Theatre is producing the play again in 2012, along with the other two plays in the Brother/Sister trilogy by emerging playwright Tarell Alvin McCraney. I really grew to know and love these characters over the course of the play, so I'm curious to find out what happens to them next. Stay tuned. The characters in In the Red and Brown Water are named after gods in the Yoruba mythology of Nigeria; the child/prophet Elegba, the attractive bad boy Shango, the good and stable man Ogun, and our heroine Oya. A unique feature of this play is that the characters speak their own stage directions aloud. "Shango enters," "Elegba exits," "Oya weeps." It was a little jarring at first, but once I got used to it I really liked it. As was discussed in the talkback, it's another opportunity to more deeply understand the characters. The way the actors say the stage directions gives the audience insight into their feelings: sad, angry, confident, joyful. Towards the end of the play Oya begins to say everyone's stage directions, perhaps because she's starting to take control of her own life. This is a top-notch production and the cast is amazing; I will definitely be checking out other productions at Pillsbury. Christiana Clark plays Oya. Not only does she look like an athlete, but she also beautifully embodies Oya's spirit - her confusion, desperation, and determination. Gavin Lawrence plays the delightfully devilish Elegba, who grows from a boy to a young man. Elegba is one of those characters who seems simple, but is actually quite wise and profound (the title of the play comes from a dream he has about Oya's future). Gavin is very convincing in that transition, and has a lovely voice when he sings for Oya. From Sonja Parks as Oya's mother, to Ansa Akyea and James A. Williams as her suitors, to the great Greta Oglesby as her aunt, to every last member of the ensemble, the cast is just beautiful. 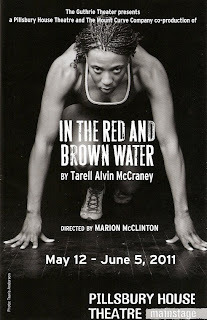 I can't say it better than this, from the Guthrie's publicity postcard about the show: "Lusciously theatrical and boldly original, this play weaves together elements of urban contemporary realism with West African mysticism for a lyrical experience that is at once joyous and challenging, raucous and raw, and brazenly beautiful."